>WHAT A WONDERFUL YEAR IT HAS BEEN! When I really sit and think about it, 2010 has flown by and so much has happened to and for me. Let’s recap. The month of February marked the first time I had ever stepped foot into the tents at Mercedes Benz Fashion Week. My first show was the Heart Truth Red Dress Collection. My fairy blog mother Kathryn (The Budget Fashionista) emailed me and said she was unable to make it and asked if I wanted to go. Uh, hell yeah! I remember that day like it was yesterday. I was so nervous because I didn’t know what to expect and most importantly what to wear. As luck would have it, I went to work that day looking a hot mess. It was freezing cold and we were just getting over a snow storm. I ran into the NY&CO by my job to find an outfit, but, it was not fashion week worthy. So, I kept my coat on the whole time and wore a really cute pink hat and threw on some makeup. I promised myself I would be prepared for the next show. The experience was amazing. Within that same week, I also went to the Lela Rose fashion show which was spectacular. The designs were so architectural and sophisticated. I also got to meet my dream hair stylist Ted Gibson who was super nice and thought me and my hair cut was adorable. Later on in the year, I was featured on Glamour’s website as Stylish Reader of the day. I know you should never rely on any one’s approval of your personal style, but, I would be lying if I didn’t consider Glamour’s feature as a stamp of style approval. I sent my picture in telling them that curvy girls can wear horizontal stripes and I’m proving it. A few months later I was featured in Plus Model Magazine and interviewed by the fabulous Maddy who I met at the Lane Bryant Blogger Conference. 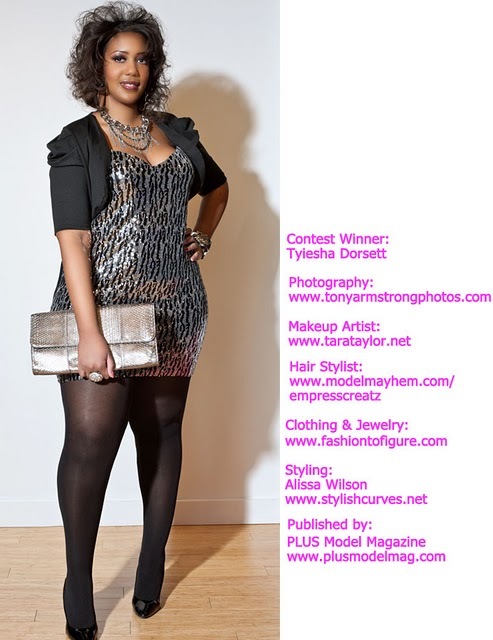 Towards the end of the year I got to get my feet wet as a stylist thanks to Fashion to Figure and Plus Model Magazine. I was blessed with the opportunity to hook up one lucky winner with a fabulous fashion to figure outfit. The experience was amazing and I learned so much. It is a bigger challenge dressing someone other than yourself. I am also truly thankful for being part of some amazing conferences like Lane Bryant, Just My Size, and Jessica London. I love that you all wanted to reach out to the plus size community to better your products. I am very grateful for all the wonderful opportunities and experiences I’ve had as a blogger. Last and surely not least. To all of Stylish Curves readers. You will never know how much you mean to me. I think about you guys all the time whenever I am putting together a post. I think about how you will receive it and will it be helpful, informative, or interesting enough for you. I can only hope that I have accomplished this task and that you have enjoyed reading Stylish Curves for an entire year.